We’re in full swing with the final preparations for 2018 and hope that might consider volunteering your time again for this year’s event on the 26th of August. Volunteers are provided with all the equipment required for the task, full work instructions and onsite briefings where appropriate. Most briefing sessions will occur the weekend before the event and should only take about 30mins. Some detailed tasks may take a little longer. We are also after people to help set up and pack up on the Saturday and Sunday of race weekend. A potluck is a gathering where each guest contributes a different and hopefully unique, and often homemade, dish of food to be shared. Remember to check out the Shepparton Runners Club Facebook page. Here you will find all races most likely attended by SRC members. On the main page, you will see an events tab. Just click on that and remember to click going if you are going so others know and may assist you in carpooling. The Shepparton Running Festival now has Kathy and Narelle’s 12in12 marathons cause as an official charity partner. Follow Kathy and Narelle on Facebook. More daylight hours from today on. What inspired you to start running? Retired from netball and wanted to try something else. My husband Grant was always a runner and a great encouragement to me. 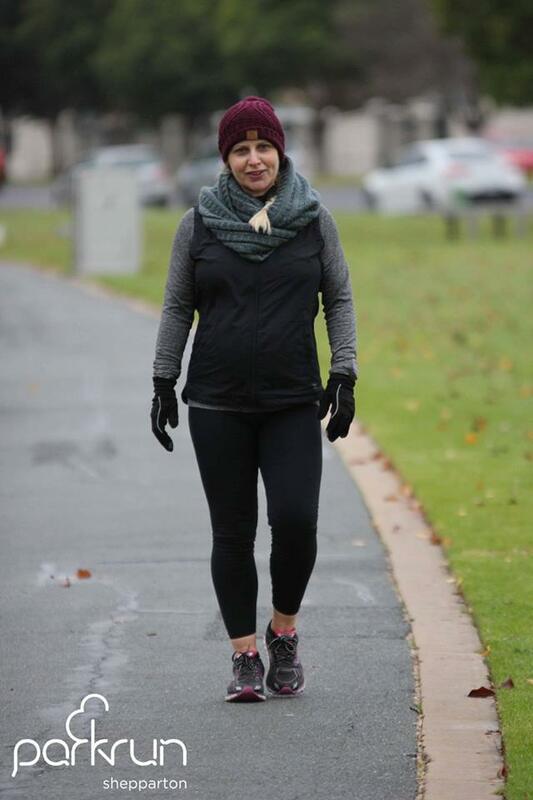 After my second child I decided to give it a crack and once I moved from the treadmill to outside running I began to really enjoy the challenge and the setting and achieving of goals. Great feeling! Depends what I’m training for. Currently 0 days and training for birth! Usually 4-5 days varying long runs, intervals, hills and recovery runs. Think I have a tendency to over do it and do too much but I just love the feeling of an early morning run and the positivity it sets up for the rest of your day. Currently with my No running status I’m using the eliptical and bikes at the gym. Must keep up some strength conditioning, especially with my weak glutes. To run again! I get so jealous hearing everyone’s running goals. 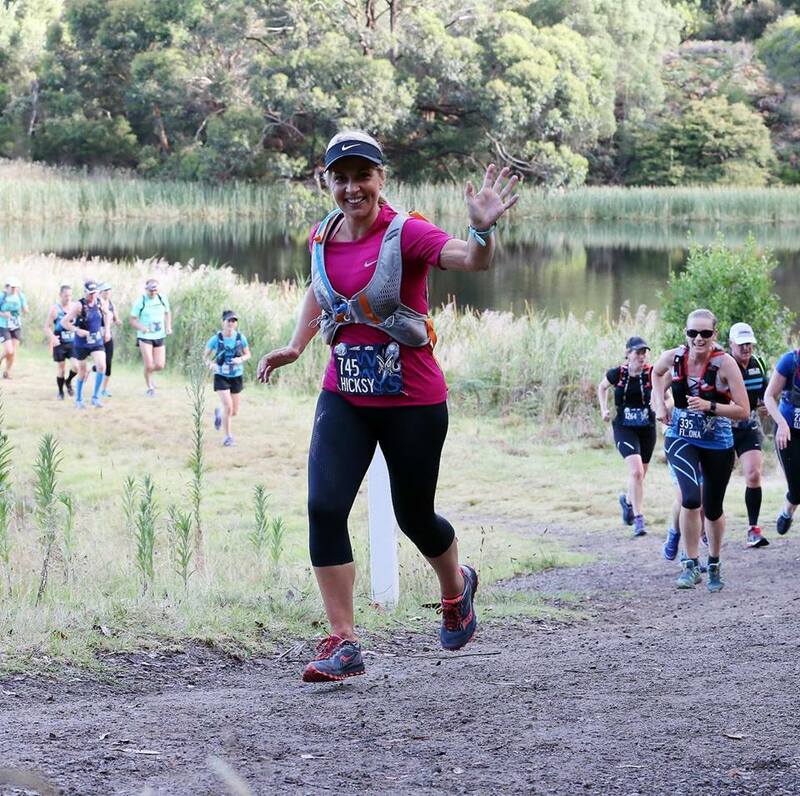 I’m nervous about the long road back after Kevin’s scheduled birth sometime around Shepp Running Festival this year and hope that everything will work again. My big goal is to do my first marathon before I turn 40 next year. Keeping my dodgy left side injury free. Ankle and glutes frustrate me at times. I need to stop being so lazy and keep up with conditioning. I start to feel good and then get a bit complacent. The biggest breakthrough in running. First trail run at Surf Coast Century was an eye opener and I caught the bug there for trails. So much fun. Leg 1 Surf Coast Century. Those towering cliffs on one side and the crashing waves on the other at sunrise are just majestic. Everyone running at Park Run each week. Ultra Runners boggle my mind. Grant Hicks….”3 kids is a lot”….maybe I should listen to my husband more. Always wanted to know what Reformer Pilates is like? Give the clinic a call on (03)5831 5400 to lock yourself in and take up this great opportunity! For those that attended the session with Paul Ford last Thursday as he taught us about some techniques for strength and conditioning. You will recall him stating that knee pain is not often caused by a problem in the knee. The cause often comes from the foot or the glute. I’ve had an Osteopathy, Podiatrist, Sports Doctor, and now Paul all say the same thing. No one is working on my knee, even though that is where the pain is. I did have some pain in the ankle but that has been gone now for 3 weeks. The Shepparton Runners Club is looking into regular sessions with Paul Ford in the weeks preceding the Shepparton Running Festival.If you are interested please let Chris Armstrong know. As I am completing my 4th week of no running & strength training rehab I decided to get a gait analysis. I booked online at Lakeside Podiatry https://www.lakesidepodiatry.com.au and was lucky enough to get in the same day. If you want a gait analysis you have to book with Steven Goodwin as he has the treadmill in his room. His diagnosis was fairly technical so I can’t go into it in detail. The video showed my right food pointing out when it hit the ground putting pressure on my knee. The power of your leg comes from the big toe. My foot was pointing out to create enough power for liftoff. This problem, with the week glute was causing the pain in the knee and the mechanics in the foot were not helping. Steven Goodwin gave me some advice on shoes with zero lift and also foot exercises with a stretching band. And as I often mention subscribe to Expressions of Pye, by Sarah Pye for information on elaborating on what I have mentioned here. Sarah also loves to keep fit by doing triathlon and going to the gym –She is a qualified personal trainer and she loves to lift weights and feel strong. The long run sets distance runners apart. Online coach Ian Torrence looks at the physiological adaptations that occur by running farther, what the fitness gains are, and then talks about managing the length and execution of your long run by following his guidelines in this article at iRunFar. It was super cool and a big honour to be interviewed on iRunFar.comlive. neither good nor bad – it’s just different. SRC E-news Boston & Easter edition.